A huge thank you to all the people who took part in the FunTri 2010 and equally to all of the people who helped out at every stage and on the day to make it the success that it was. Most of the money has now been collected and over €1,000 has been raised for The Bridge Foundation. Although mostly for fun times were taken. They are available in Excel Format here and in PDF Format here. 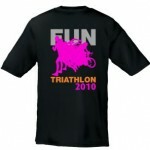 Also it there are a limited no of tshirts left from the fun tri (Click the image below to see the large version). They are available for at €5 per Tshirt. Email thosfoley79@hotmail.com or call 0877437002. All proceeds will be donated to the Bridge Foundation. Finally just to say thanks again!